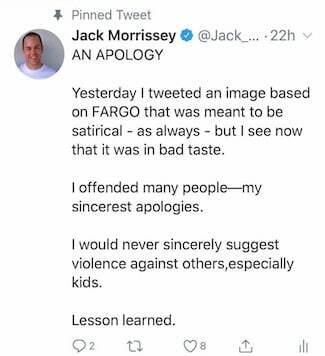 Film producer Jack Morrissey apologized Monday for joking about “MAGA kids” going “screaming, hats first into the woodchipper.” The tweet was accompanied by an iconic image from “Fargo” in which a dead person’s blood flies from a woodchipper. Morrissey, whose credits include “Beauty and the Beast” and films in the “Twilight” franchise, quickly deleted the tweet and apologized, but Sarah Palin and other critics slammed him on social media. 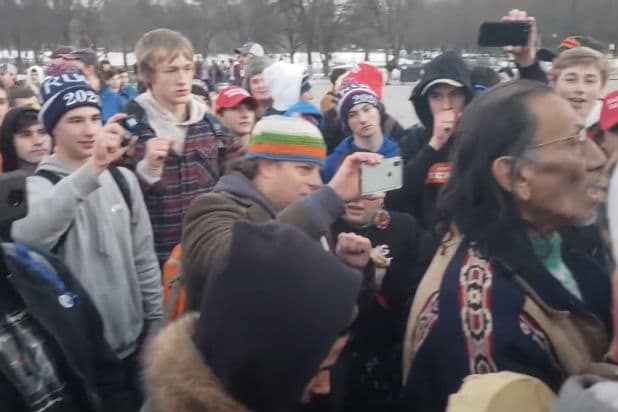 Passions ran high on social media Saturday after video emerged of several students from Covington, Kentucky, many of whom were wearing “Make America Great Again” hats, surrounding a Native American elder who was in Washington, D.C. for the Indigenous Peoples’ March. Many viewers believed the teens were attempting to taunt the elder, Nathan Phillips. Morrissey said he deleted the tweet as soon after noticing negative reactions to it online. He then tweeted out an apology before locking up his entire feed from public view. Asked whether he had changed his mind about the students’ behavior as more video emerged, Morrissey said he had not had time to research the situation deeply because he was too busy dealing with the fallout from his tweet. “I have seen tweets from both sides feeling disappointed that the mainstream media went his way or that way. But I haven’t had the headspace to take the time to watch all the videos,” he said. Disney, the studio behind “Beauty and the Beast” did not immediately respond to a request for comment Monday. Last year, Disney fired “Guardians of the Galaxy” director James Gunn after a right-wing media personality and conspiracy theorist Mike Cernovich resurfaced a series of offensive tweets Gunn made about about pedophilia and molestation.